The core muscles consist of the transversus abdominis muscle, multifidus, diaphragm, and pelvic floor muscles. These should all be contracted simultaneously in order to gain maximum stability in the abdominal and lower back region. The core muscles are the powerhouse of the body and allow smooth contraction and movement of the arms, legs, and back. To learn more on the theory behind core stability exercises see introduction to core strengthening. This is a vitally important step to get right from the beginning and may need some work at first as it is not a contraction that many people do consciously. Different visualizing techniques are used to contract the core and everyone normally has one that works best for them. Below are some of the most widely used. Find the technique that works for you and stick to it. In the following stability exercise pages, use your preferred method when prompted to engage your core muscles. In order to know whether you are contracting the correct muscles, it is necessary to be able to feel them working. Place your hands on the bony parts at the front of your hips. 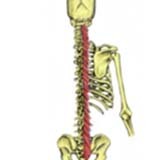 These are known as your anterior superior iliac spines (asis). Move your hands in an inch towards your belly button and down an inch towards your toes. 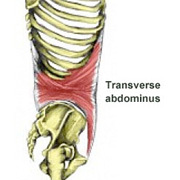 You should now be directly over the transversusabdominus muscle. As all the core muscles co-contract, when you feel your transversus contract the others will be contracting also. Keep your hands in this position and try each of the techniques below to find which one works for you. How do I know if I’m engaging my core? When you contract your core correctly you should feel a gentle tightening under your fingers when they are in the above position. If you feel a bulge you are contracting too much. The correct level of activity in core muscles should be 30% of their maximum so that they have enough energy to contract continuously. To contract the right amount, use the techniques below to maximally contract, then leave off the contraction by half and then by half again. This takes practice but is extremely important to get right in the early stages. Failure to contract properly will mean unwanted contraction of the larger muscles surrounding the core. These will take over movements and thus defeat the aim of the exercises. All the following movements should be carried out whilst lying on a firm surface. Bend your knees and hips so that you are lying comfortably on your back with your knees up and feet shoulder-width apart. Make sure your shoulders are relaxed and concentrate on breathing into the sides of your ribcage to take emphasis off the diaphragm – try not to breath into your abdomen and not into your upper chest. Remember to breath normally throughout all the exercises- it is common for beginners to hold their breath as they focus on contracting the core. Whilst lying in the above position, imagine that a belt with 10 notches is tied around your abdomen. Take a deep breath in and on exhalation visualize that the belt is being fastened up to the tenth notch. Using the above transversus palpation technique can you feel a tightening (not bulging) under your fingers? Now visualize leaving the belt off to the 3rd notch. In the same position as above take a deep breath in. On exhalation focus trying to lower your belly button down towards the floor. Palpate for a contraction of the transversus. Now ease the contraction off to about 30% of its max. The above techniques focus on contracting transversus abdominus however it is common to find these exercises difficult. The next technique is focused on contracting the pelvic floor as an alternative. In the same position as above take a deep breath. On exhaling focus on ‘drawing up’ from the pelvic floor. Imagine that you wish to stop yourself going to the toilet however make sure you do not overuse the other abdominal muscles- this would result in a ‘bulge’ rather than a tightening under your fingers. Choose one of these techniques and practice it until you can do it quite easily. It may take practicing each technique a few times before you decide which one works best for you. Once you can achieve a good independent core contraction you are ready to begin the core stability program.